WASHINGTON (CNS) — A rainy Washington morning greeted the new archbishop of Washington April 5 as he began to get to know his Washington home. The day after being named the seventh archbishop of Washington by Pope Francis, Archbishop Wilton D. Gregory, accompanied by his predecessor Cardinal Donald W. Wuerl, visited some of the sites and people of the Archdiocese of Washington, which includes the nation’s capital and the five surrounding Maryland counties. The first stop was Catholic Charities of the Archdiocese of Washington where the new archbishop was greeted by Msgr. John Enzler, president and CEO of Catholic Charities, other leaders of the agency and some of its clients. 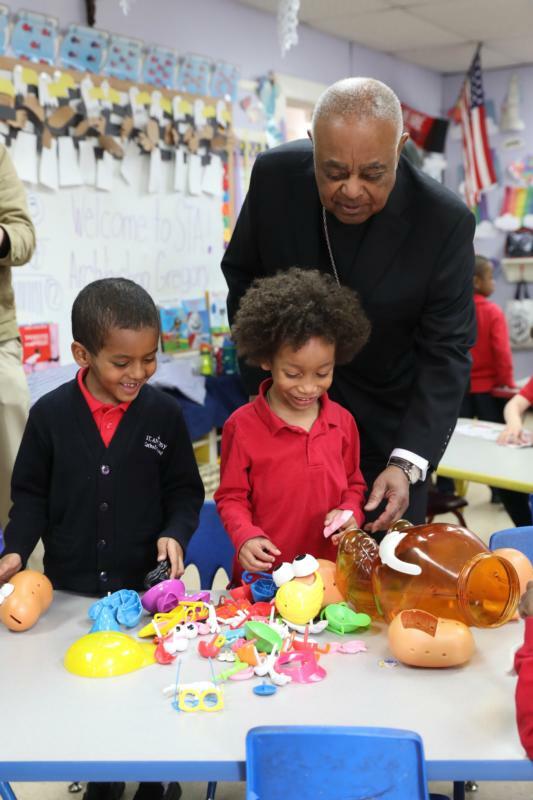 The archbishop also visited St. Anthony Catholic School in Washington where he met school leaders and students. He also told them his favorite class was history. Although he is overjoyed to be in Washington, he told the second-graders he will miss his community in Atlanta, where he was archbishop since 2005. Archbishop Gregory also met a fifth-grade student who is discerning a vocation to the priesthood. The prelate told the youngster that he himself was in fifth grade when he began thinking about being a priest. That afternoon, the archbishop and Cardinal Wuerl visited the Little Sisters of the Poor at their Jeanne Jugan Residence for the elderly poor in Washington. The 11 sisters who live in the residence were joined by members of their community who traveled from other residences in nearby states. Archbishop Gregory also met and spoke with the home’s elderly residents. He also asked for their prayers. Later that afternoon, Archbishop Gregory visited and celebrated Mass at the archdiocese’s St. John Paul II Seminary in Washington and joined the seminarians and priests there for dinner. That evening, he visited a fish fry at Nativity Parish in Washington. Restuccia writes for the Catholic Standard, archdiocesan newspaper of Washington.